The queen is back, and she's taking 2018 by storm. 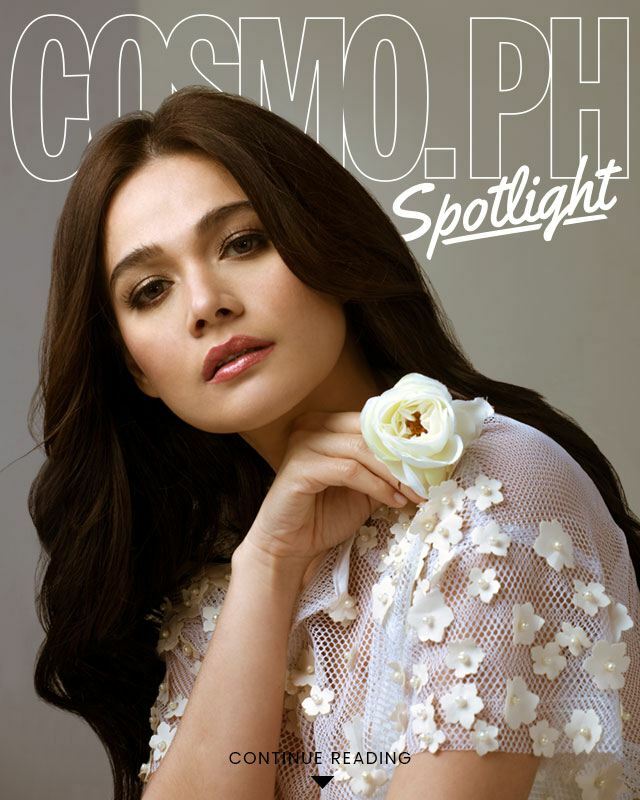 Bea Alonzo walks into Studio 9 in a white dress that ever so slightly grazes the floor. It's almost jarringly ethereal to see her in person—oh my god, it's Basha, it's Andeng, it's Betty La Fea—after years of watching her on TV in your childhood home, glancing up at her face on an EDSA billboard, or having heard her voice fill up a dark cinema. As she makes her round of introductions, the room bursts into life—editors, videographers, and stylists rise from their chairs and hustle to their places for the shoot—and the scene begins to unfold. Characters assume their roles, lights go up, and Bea, today's lead actress, finds her light and flashes her pearly whites. As we watch her stare intently into the camera, as if she is looking into the eyes of a brand-new lover, we are as enamored as we were all the way back in 2001, when she entered show business for the first time. Ready, and—scene. In the early aughts, one often didn't utter the name "Bea Alonzo" without also mentioning her longtime on-screen partner, John Lloyd Cruz. The love team took the industry by storm for the better part of a decade, but over the years Bea has forged for herself a brand new path: that is, one that keeps her genuine dedication to the craft, rather than inducing kilig by association, at the forefront. And now that she's 30, she wants nothing more than to push her acting prowess to its very limits. This is going to be an exciting year for you, what with Kasal, Eerie, and a new film with Aga Muhlach in the works. How are you feeling about your career right now? Kinakabahan ako, kasi [I don't know if] I'll have enough time to actually create a new character again. [Aga and I] will be filming in June, and I will be finishing promotions for Kasal on May 16. Natatakot ako doon sa preparation. But at this point, the more challenging the project, the better. I want to go after the things that scare me. It gives me drive. It gives me a different kind of perspective. It's my first time working with Paul Soriano [as well]. Natutuloy yung mga plano ko last year pa, na [gusto kong gumawa] ng films na iba-iba yung genres, with different directors. New directors. Younger directors. I'm very excited. Eerie is your first foray into the horror genre. What was it like to work with [internationally acclaimed Birdshot director] Mikhail Red? I must commend him for having authority on set, which I didn't expect from a younger director. At the same time, he respects everybody's art form. If you're an artist, you do your own character, but this is my take on it. If you're a production designer, you do your work, and I will give you my suggestions. It was my first time to work with a director who had a storyboard for the entire movie. Kung ikaw yung artista tapos gumagawa ka ng character, makikita mo yung shots, and you can plan ahead—how to prepare for a scene, especially when it gets intense. With Eerie, we were filming 12 sequences a day, so it was tiring. His directing style allowed me to plan kung saan ako bibigay, kung saan yung kaya kong technique. Actors are required to bear a deep emotional toll; as they breathe new life into each character, they also lend it a part of themselves. Think of emotion as a dynamic ball of fire; in any given scene, co-actors must carefully source this emotion off of one another so that the story evades cliché and the stakes are established. Performance is inextricably tied to collaboration. So even with years of experience under her belt, Bea continues to take notes from those she shares the screen with, those who handle that ball of fire as masterfully as she does. Actors often get a bad rap for hyperfocusing on themselves, but when it comes to her scene partners, Bea could gush about them all day—a testament to her humility and an acknowledgment that she didn't make it to the big leagues without their mentorship and support. What was it like to act alongside Charo Santos-Concio in Eerie? I've never worked with an actress na nasu-surprise pa rin ako kung paano niya pinuputol yung mga linya. Voice drama is so important in acting. I used to think that, as long as mararamdaman mo yung nararamdaman ng character mo, the change in your voice would follow. Yung nagka-crack siya na hindi mo pinaplano 'pag naiiyak ka. 'Pag natatakot ka, nanginginig na lang yung boses mo. She showed me na mayroon pala na mga bagay na pwede mong iplano. Napansin ko 'yon sa line reading pa lang. She plots the line break, and then she plots where she places her "choice"—ibig sabihin, what or who she will think about in that specific line. It takes a seasoned actress to command and to control which parts she will emphasize. Minsan, doon ako natatakot. "Tatalon ba ako? Sana maabot ko." Pero siya, alam na niyang maaabot niya. Kaya nako-control niya. She is brilliant. You co-star with Derek Ramsay and Paulo Avelino in Kasal, both of whom you've worked with previously (Derek in And I Love You So, Paulo in Sana Bukas Pa Ang Kahapon). What are the differences in the way they approach a romantic leading role? Paulo is more subtle. That's how he handles scenes, and I like and appreciate that about him. Very subtle. Kasi ang background naman niya talaga is independent films. Si Derek, 'pag napapanood mo siya, parang he was born to be an actor. He was born to be a leading man. And both are a bliss to work with. It's perhaps the most widely-accepted occupational hazard in show business that your romantic life will be poked, prodded, and picked apart by a prying public—heartbreak becomes tabloid fodder, and new romances vanish quickly. Actors need to strike a balance between sharing their lives with those who follow their work and keeping their individuality intact, but with Bea being a household name, this often proves to be difficult. She remedies this by zeroing in on introspection—allowing herself to feel the full range of her real-life emotions so that they come naturally to her on set. "I consider myself as an actress, not a celebrity. You can see that [in the amount of] social media accounts I have. I only have Instagram. Lahat ng tao pinu-push ako to create different social media accounts. I know that I should keep up with the changing times, but I want to do that gradually." You've always been in the public eye. How do you stay in touch with your individuality? As an actress, it's almost a necessity to keep in touch with who you are as a human being. You have to tap into your emotions every single time. You have to address each emotion, may it be anger or hurt or happiness or kilig. Hindi mo siya pwedeng i-conceal. Kasi, paano kung kakailanganin nila 'yon sa "menu" mo as an actress in the future? Now that you're 30, how have your romantic expectations changed compared to when you were younger? I used to be more idealistic. Si Mr. Right, dapat ganito, ganito, ganyan, ang daming expectations about the qualities he should possess. But I realized, of course, na you can't really plan love and who you fall in love with. I still believe in destiny and I know that mayroon talagang nakatakda para sa akin. For somebody adept at rehearsing fictional scenes and playing out pretend happy-ever-afters, Bea's take on love is radically defiant. But the greatest love letter she will ever write is not to any man, but to the industry that has raised her: "Ito yung pangarap ko," she begins. "Gusto ko na magkaroon ng theatrical release yung Filipino movies sa Southeast Asia, Europe, and America. Like Train to Busan. That's my dream. Gusto ko hindi lang sa festivals. Gusto ko sa theaters talaga." Bea Alonzo's filmography is already so storied that it's exciting to imagine where she could possibly go from here. There are genres she has yet to explore, actors she has yet to work with, boundaries she has yet to expand. But even as show business evolves around her, and as new faces and talents begin to emerge, Bea is steadfast in the assurance that change is not the enemy; if anything, change is the catalyst that pushes her forward and allows her to evolve on her own terms. And this year is only the beginning.